Just off the needles - 1 very small pretty project and 1 large & rather ugly theatrical project. 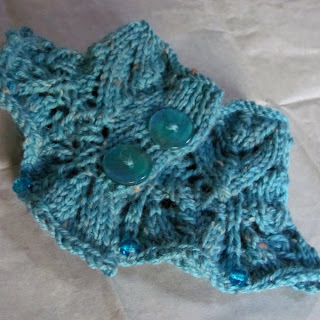 The pretty one first - a neckwarmer or scarflette for my niece. She likes all the mermaid colours and when Bendigo Woollen Mills sent me a card about their newest yarn "Highland" I thought she would the teal blue shade (called Loch) for a quick little birthday pressie. Invented the pattern as I went, using a couple of lace patterns that have wavy edges, nice blue/green buttons and some beads on the points for added prettiness. Now the less than pretty theatrical project - a shawl to be part of a very tatty and broken down costume. By the time it gets to the stage it will have been dyed and will look somewhat different - but here it is as it left my needles. They also wanted the fabric between the ladders to have a bit of a roll / not completely flat. 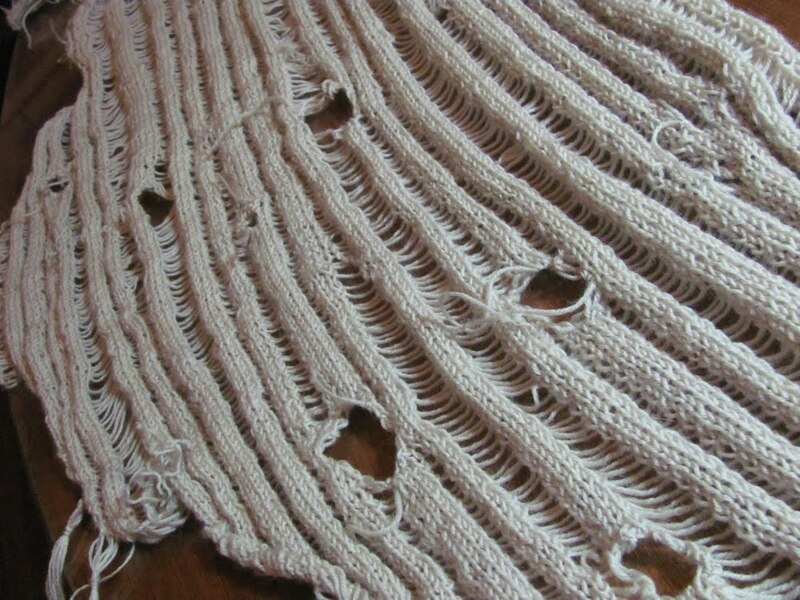 I’ve never knitted a Clapotis but remembered seeing them and remembered that they have a bouncy roll between the dropped stitch ladders … looked up the pattern … there are Knit through Back of Loop stitches either side of the ladders, an idea I copied so I'm calling this a "Clapped-Outtee".